(SEPTEMBER 26, 2016) Larner College of Medicine faculty members Alexandra Potter, Ph.D., assistant professor of psychiatry, and Matthew Albaugh, Ph.D., postdoctoral associate in psychiatry, were guests on Vermont Public Radio’s live interview program Vermont Edition, with host Nina Keck. 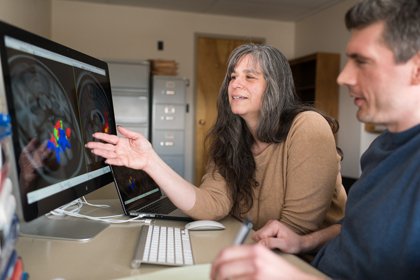 They discussed UVM’s participation in the ten-year-long Adolescent Brain and Cognitive Development study being sponsored by the National Institutes of Health. Potter is a co-principal investigator on the study with Hugh Garavan, Ph.D., professor of psychiatry, at the Larner College of Medicine at UVM site. Listen to audio of the program here.